. . . (This is) just some raw footage from 9th Street Trails in Austin on March 16, 1996. Riders include: Ron Kimler, Taj Mihelich, Stuart King, Chris Saldivar, Ed Koenning, and Todd Moon. There was some kind of jam . . . I don’t remember the occasion–that’s why there were so many people standing around. Jay Miron was there that day as well . . .
Keith Mulligan was also there shooting the photos that would eventually run in Taj‘s interview in Ride. 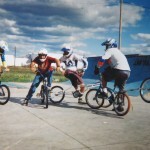 This entry was posted in Video and tagged 9th street trails, bmx, chris saldivar, cullen mcmorrow, ed koenning, Freestyle, Jay Miron, keith mulligan, ron kimler, Stuart King, Taj Mihelich, trails. Bookmark the permalink. I remember this day vividly, I had just moved to Austin a few months prior and met the nicest bunch of BMXers on the planet at 9th street. Sitting on the log and watching Taj ride was our greatest past time. Lets just say, those 9th jumps were too small for him. I think Bestwick & Taj by far have the most style and power in their riding.